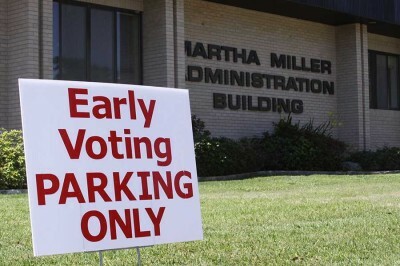 "Lone Star Historian" is a blog about the travels and activities of the State Historian of Texas. Bill O'Neal was appointed to a two-year term by Gov. Rick Perry on August 22, 2012, at an impressive ceremony in the State Capitol. Bill is headquartered at Panola College (www.panola.edu) in Carthage, where he has taught since 1970. For more than 20 years Bill conducted the state's first Traveling Texas History class, a three-hour credit course which featured a 2,100-mile itinerary. In 2000 he was awarded a Piper Professorship, and in 2012 he received the Lifetime Achievement Award from the Wild West Historical Association. 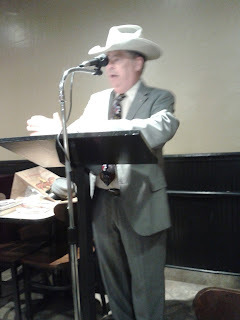 Bill has published over 40 books, almost half about Texas history subjects, and in 2007 he was named Best Living Non-Fiction Writer by True West Magazine. I first visited Stamford in 1994. I was researching Historic Ranches of the Old West, and I needed to stop at the headquarters building of the far-flung SMS ranches, located just off the Stamford square. I noticed several fine old buildings in town, but I had a pressing schedule. Despite promising myself to return as soon as possible, in subsequent years I've been in a hurry each time I've passed through town. Finally, early in May, I was able to spend half a day in Stamford while en route to an evening speaking engagement. My first stop was at the Cowboy Country Museum on the square. I assumed I would be in the museum no more than half an hour. But I was greeted by curator Sandy Rhea, who enthusiastically led me from room to room, revealing one treasure after another. I was enthralled, and when I asked questions, Sandy enhanced her answers with artifacts or photographs. The museum receives frequent donations of artifacts, and expansion of the facility is in progress. Stamford's first professional photographer donated a superb photo collection, which was added to by his son, also a local photographer. In the museum gift shop copies of Stamford, an Arcadia pictorial history were on sale. When I was told that the museum's photographic collection formed the basis of the book's illustrations, I immediately bought a copy. After leaving the museum I inspected a massive three-story commercial building on the square. Although now abandoned, the big structure long was a focal point of downtown activity. Across from the SMS headquarters building stand the majestic ruins of the Stamford Inn, for many decades the town's principal hostelry. Several blocks down the street, and still in use, is a three-story Carnegie Library. While driving through town on previous trips I had noted two magnificent churches. I toured the First Baptist Church, which was erected in 1908, during the pastorate of Frank S. Groner. When Groner was called to Stamford in 1905, the Baptists were meeting in a small frame building. Groner, soon to become a major leader of the Southern Baptist denomination, launched a building program. The church features a dome and an auditorium with a large balcony, handsome pews, and a pipe organ. Faithfully maintained, the church remains a fine place to worship. So does the First Methodist Church. Built in 1910, the auditorium has a vast balcony and beautiful stained glass windows. Outside, the bell tower soars to a height of 100 feet, and the Methodists could boast of "the tallest church building between Fort Worth and El Paso." Since 1930 Stamford has hosted the "Texas Cowboy Reunion." During four days of events around July 4, the population of Stamford triples. Famed cowboy humorist Will Rogers attended an early reunion, describing it as "a real celebration in a real cowtown by real old-timers." On my way out of town I drove to the reunion grounds on the west side of Stamford. I knew that my long-delayed tour of Stamford would not be complete without a visit to the site of the Texas Cowboy Reunion. As the 2012-13 school year comes to a close, I want to blog about several end-of-the-semester items. On my last blog I mentioned commencement exercises at Panola College, where I still have an office as State Historian. My office is in the Science Building, which was built in 1965. When I came to Panola as a history instructor in 1970, I was assigned an office in the "new" Science Building. More than four decades later the building still is handsomely maintained, but it no longer is a cutting edge home for modern science instruction. A new and updated science building has been proposed, along with other construction projects. Opened in 1948 in surplus World War II army buildings, Panola County Junior College erected two permanent brick structures with $400,000 in bonds. That initial bond issue, passed 65 years ago, is the only one in the history of the college. The student body has more than tripled since my arrival, and subsequent buildings have been financed through the general fund, grants, and donations. So this year a $35 million bond issue was passed and promoted tirelessly by President Gregory Powell. On May 11, Saturday, following the Friday night commencement exercises, the bond issue passed by a resounding 84 per cent of the vote. During the next five years construction projects will transform the campus. In December 2012 I was interviewed by Topher Paddie, a young student from Marshall. Topher's parents are Chris and Brooke Paddie (Chris is in his first term in the Texas House of Representatives). As part of his social studies project on the Texas Governor's Mansion, Topher interviewed the State Historian. Recently Topher learned that his excellent project had earned first place in statewide competition in the elementary division. At the awards banquet he was present a gold medal - a proud climax to his school year. Another deserved award was presented to my niece, Katy Ashby of Lake Jackson. 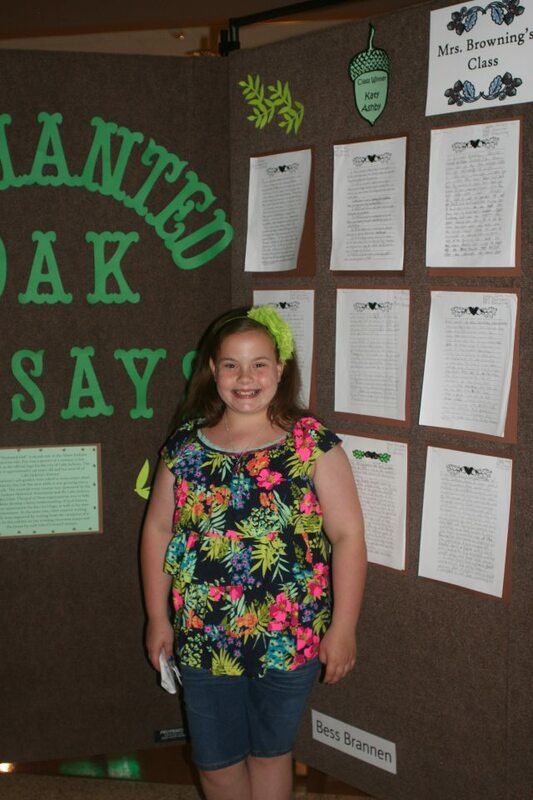 A fourth-grader at Bess Brannen Elementary, Katy won first place in the Enchanted Tree Essay Award competition. The "Enchanted Tree" is a big oak that was standing when Abner Jackson - for whom Lake Jackson was named - established a plantation. Each year Lake Jackson fourth- and seventh-graders are told about Abner Jackson, the Enchanted Tree, and related historical events. Students are then asked to write an essay from the perspective of the Enchanted Tree. Katy described the tree observing Civil War soldiers before the Jackson plantation was formed. Katy's tree saw Abner Jackson found his plantation, and later the tree viewed one of Abner's brothers kill another brother. The tree survived the ferocious hurricane of 1900. Katy's first-place essay earned her a sack of gold coins (mostly Sacajawea dollars), and it is on display at the Lake Jackson Historical Museum. Katy's fourth-grade year has climaxed on a high note. For the final time this spring I presented a program on "Texas Cowboys." 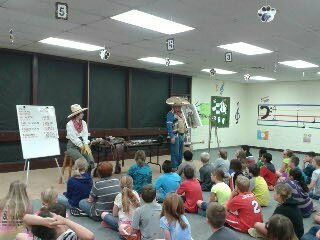 To the fourth-graders of Spring Hill Intermediate School, I showed sombreros and ten-gallon hats, spurs and branding irons, saddles and high-heeled boots. But a big difference in this program was the presence of my wife, Karon. She happily terms herself the "Chief of Staff" of the State Historian, and if not for Karon's technical expertise and efforts this blog would not exist. We have appeared together in period costume at programs and conferences throughout the West. Karon has accompanied me on State Historian weekend trips, but she teaches math at Panola College and has been unable to accompany me during the week. At Spring Hill Intermediate, Karon wore a fine cowgirl outfit, to the delight of the young ladies of the fourth grade. I look forward to the company of my Chief of Staff during the State Historian activities of the upcoming summer. For decades at Panola College I spent Final Exam Week grading Blue Book essays, averaging grades, and attending commencement exercises. This past week, while my wife Karon spent Monday through Friday with these activities in the math department, I left Carthage early Monday morning. By mid-day I was in Van Alstyne, where I unloaded a saddle and miscellaneous cowboy paraphernalia at the elementary school. 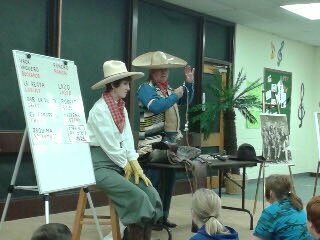 Librarian Becky Seevers turned over her room to the fourth grade teachers and students, and in costume I presented a program on "Texas Cowboys." Each year the entire fourth grade is bused to Austin, where they tour the State Capitol, the Bob Bullock Museum, the Texas State Cemetery, and other historic sites. One day after my visit, the fourth graders were bused to the famous Mesquite Rodeo. The teacher who has long spearheaded these trips is Rajonia Carnley, and as State Historian it was my privilege to present her a Certificate of Achievement for outstanding service and commitment to Texas History Education. The event was covered by the Van Alstyne Leader, and the youngsters were primed for their rodeo visit. I left Van Alstyne headed to West Texas. Along the way - and on the return journey to Carthage on Wednesday - I stopped at a variety of historical sites and gathered material for future blog topics. On Tuesday evening I was in Roby, seat of Fisher County, to deliver a program on the Johnson-Sims Feud, which was the last blood feud in Texas. This 1916-18 conflict occurred in the area and local citizens were involved. Years ago I was informed about this feud by Bob Terry, a native of Roby and a highly knowledgeable local historian. His ancestors, lawmen Nath and Frank Terry and Judge Cullen Higgins, were involved in the feud, and Bob was instrumental in my research efforts. I first wrote about these events in my 1998 biography of Pink Higgins, then in The Johnson-Sims Feud, published by the University of North Texas Press in 2011. I came to Roby at Bob's invitation, and the program was scheduled for the Fisher County Museum on the square. Roby is a small town, but the museum offers a rich collection of the community's pioneer past. At the museum I enjoyed renewing old acquaintances and meeting new friends. A large audience gathered to hear my account of the feud, and they purchased a great many books for personal inscriptions. I arrived back in Carthage on Wednesday afternoon, and the following evening, I drove to Longview to deliver a program to the History Club of East Texas. The members are dues-paying history buffs who attend monthly gatherings throughout the school year with the sole purpose of enjoying a program on a history topic. 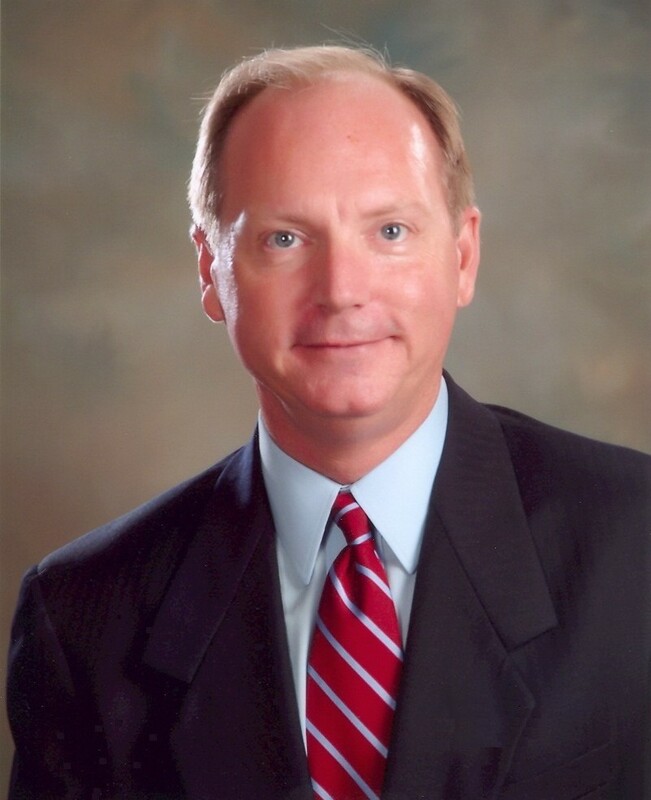 I am a longtime member, and I am asked to deliver the leadoff program each year in September. This spring a speaker was unable to make the May meeting, so it was my pleasure to provide another program for my fellow history enthusiasts. The next day, Friday, my wife and I welcomed our daughter, Dr. Berri O'Neal Gormley, and her family to Carthage. Berri was a 1995 graduate of Panola College, where for two years she served as the school mascot, Fillis the Fillie; performed in the drama and music departments; was an officer of the student government and of Phi Theta Kappa; and generally had a rousing good time. Today she is the Director of the Universities Center of Dallas and the immediate past president of TACRAO (Texas Association for Collegiate Registrars and Admissions Officers). Berri was invited to deliver the commencement address at her community college alma mater. Commencement exercises were held in the main gym. There was a packed house, with an overflow crowd that watched the ceremonies on closed-circuit TV from the next-door auditorium. Berri was excited and proud - and so was her father. the far end of this aisle. During World War II more than 425,000 Axis prisoners of war were incarcerated at over 650 POW camps across the United States. More than 50,000 of these POWs were housed in Texas at 22 base camps and 60 branch camps. About 48,000 Germans were held in Texas, along with 2,500 Italians and 1,000 Japanese prisoners. One of the most important POW installations in Texas was Camp Hearne. I first examined the site of Camp Hearne in 2009 while working on a book for Arcadia Publishing, East Texas in World War II, which was published in 2010. A portion of this large site was under development as a museum, and when I returned last fall I found a reconstructed POW barracks open to the public. I was given a tour by a genial docent, Melissa Freeman, who informed me of other plans that were in progress. When my wife Karon and I passed through Hearne a few weeks ago, we drove to the camp site to find that, indeed, considerable progress had taken place. Melissa Freeman pointed out various artifacts that had been added to the barracks museum, while outside a "Victory Garden" was under cultivation. But the most striking addition was a reconstructed guard tower, one of nine which once had been manned throughout Camp Hearne. Camp Hearne was built on a 720-acre site just north of town. Construction of this POW base camp began in September 1942, and was completed within six months. There were three POW compounds, a hospital area, a recreation area, and an "American sector" for the force of 500 guards. A camp cemetery was located northeast of the buildings (about a dozen POWs died of illness or accidents, two committed suicide, one was murdered, and one was shot while trying to escape). Over 4,800 Germans were incarcerated at Camp Hearne, which also acquired a few hundred Japanese POWs in mid-1945. Camp Hearne had the unique distinction of being the headquarters of the German Postal Unit in 1944 and 1945. The Camp Hearne Postal Unit received and distributed letters and parcels from Germany for German POWs anywhere in the United States. The volume often soared above 40,000 letters and parcels daily, and 22 buildings in Compound I were utilized by the postal unit, which organized three eight-hour shifts six days per week. Camp Hearne closed in January 1946. Like the structures at U.S. military facilities, POW buildings were sold as inexpensive surplus. Barracks, for example, often were purchased for as little as $100 - the cost of moving a building often exceeded the purchase price. Through the years, Germans traveling in the United States often visited Camp Hearne or their other places of incarceration. In Texas there are remains of POW camps at Princeton, Seagoville, Lufkin, and other sites. But the best site is the Camp Hearne Museum, and I intend to return periodically to watch the progress at this intriguing historical location. The water tower stands after 70 years. POWs converted a barracks to a theater.